W. Scott Sonntag graduated from the University of Maryland with high honors in 1975 and obtained his law degree from Catholic University in 1979. Following graduation from law school, Scott served as a law clerk to The Honorable C. Murray Bernhardt of the United States Court of Claims. 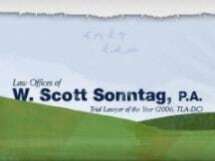 Scott is the sole principal of the Law Offices of W. Scott Sonntag, P.A. Prior to his work representing medical malpractice plaintiffs, Scott defended physicians, hospitals, HMOs, and other health care providers as lead trial counsel for over 17 years. His career as a defense attorney began at the law firm of O'Malley and Miles, until he later founded the law firm of Doran, Siciliano, Gallagher, Sonntag, and DeBlasis, LLP. At both firms, he chaired their professional liability practice groups. Throughout his professional career, Scott has been actively involved in various bar association committees. He currently serves as a member of the Board of Governors of the Trial lawyers Association of Metropolitan Washington, D.C., as well as the Peer Review Committee of the Attorney Grievance Commission of Maryland. As a defense attorney, Scott was Chair of the Professional Malpractice Committee and Judicial Selections Committee for the Maryland Association of Defense Trial Counsel. He was also just recently named one of Maryland's and Washington D.C.'s "Super Lawyers" by Law and Politics and the publishers of Baltimore Magazine for 2007, 2008, 2009, 2010, 2011 and 2012. Scott is a frequent speaker on medical malpractice issues for the Trial Lawyers Association of Metropolitan Washington, D.C., the Maryland Trial Lawyers Association, The Maryland State Bar Association, and various physician, hospital, HMO, and health care provider organizations. In addition, he has testified before the District of Columbia City Council and Maryland General Assembly in opposition to attempts to restrict the rights of victims of medical malpractice and other torts. Scott is married to Mary Lynn Reed, Associate General Counsel at The George Washington University, and a former partner at Jackson and Campbell, P.C. He has three children who are all professional actors: Dan (28) (2005 graduate of Catholic University School of Musical Theater); Amy (26) (May 13, 2006 graduate of Catholic University School of Musical Theater); and Andrew (24) (graduate of the School of Drama at Catholic University). In his spare time, Scott spends his time chasing after his two Golden Retriever puppies, Connor and Callie. Speaker, Medical Malpractice, Trial Lawyers Association of Metropolitan Washington, D.C.